Apple held its annual fall media event Wednesday. During the event, Apple CEO Steve Jobs unveiled a new line of iPods, as has become tradition, including a new shuffle, a multitouch-enabled nano, and an A4-powered, FaceTime-compatible iPod touch. The company also revealed details of iOS 4.1 for iPhone and iPod touch, as well as iOS 4.2 for iPad. Jobs kicked off the event by announcing iOS 4.1. The update addresses a number of bugs that have affected the proximity sensor of the iPhone 4, as well as issues connecting some Bluetooth devices. Jobs said that the update speeds up iOS 4 running on the iPhone 3G, which suffered from sluggish performance for many users. The update also brings a few new features for iOS 4-compatible devices. Apple added a high dynamic range option to the camera app, which helps address inherent tonal range limitations in the tiny image sensors used in mobile devices. In typical Apple fashion, there's nothing to tweak or adjust; just tap the HDR button in Camera to turn it on. When taking an image, three exposures will automatically be taken and combined to reveal more detail in shadow and highlight areas. iOS 4.1 also brings the official launch of Apple's Game Center. Game Center is a built-in, systemwide social network for games. Like OpenFeint and Plus+ before it, it offers a centralized place to view achievements and compare scores with other users. It also includes a system to challenge other players in head-to-head competitions. iOS 4.1 will be a free update made available to all iOS 4 users next week. Jobs then gave a sneak peek of iOS 4.2, slated for release in November. This version will be the first version of iOS 4.x for the iPad, and will bring all the features that iPhone and iPod touch users have been using since June, as well as the new features of 4.1. It will also bring a couple of long-requested features to the iPad: wireless printing capabilities and AirPlay—wireless streaming of audio, video, and photos. After discussing iOS, Jobs moved on to new iPod hardware. First up was a new iPod shuffle. Changing the controversial design of the third-generation shuffle, which removed the physical controls from the device itself, the fourth generation device brings back those original button controls. The new device looks like a smaller second-gen shuffle. Like the third-gen, though, it still has VoiceOver control. The new iPod shuffle comes in five colors with a 2GB capacity, and sells for $49. Jobs then unveiled a radically different iPod nano. The company removed the famous click-wheel that has practically defined the iPod since the very first version. Instead, the tiny device is now dominated by a multitouch-enabled screen. The hardware itself resembles what might happen if an iPod touch and an iPod shuffle made a baby. Like the shuffle, it has an aluminum case and a clip along with hardware buttons for volume and hold buttons. The screen features iOS-like icons for all the available features, such as playing music or videos, and makes use of multitouch. One feature uses a two-finger rotate to change the orientation of the screen, useful for when the device is clipped in an awkward orientation. 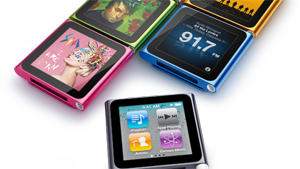 The new seventh-generation iPod nano comes in seven different colors, including a Product (RED) version. The 8GB model is $149, and a 16GB version goes for $179. Jobs bragged that the iPod touch outsells portable Nintendo and Sony gaming devices combined, making it the most popular portable gaming device in the world. To "make it even better," said Jobs, Apple made it thinner than the previous version. Despite shaving off size and weight, it also comes equipped with the same high-resolution Retina Display that debuted in the iPhone 4, the same A4 processor in the iPad and iPhone, the gyroscope motion control, and a front-facing camera for FaceTime chatting. The new iPods are all available next week, though preorders begin today.